Neither would guitarist Niklas Sundin, who along with Stanne and drummer Anders Jivarp, round out Dark Tranquillity’s original core. Together, they’ve seen and done it all. From the poetic lyrics of The Gallery and The Mind’s I to the genre-breaking sonic explorations of Haven and its more aggressive relative in Character, the group’s ventures were of vision and courage. To Dark Tranquillity, limitation, to creatively fester, wasn’t an option. They were always willing—with eyes and ears on continuity—to move forward, even in times uncertain and impetuous. Atoma, an album three years in the making, is proof there’s still more depth in Dark Tranquillity. The writing for Atoma was gradual. The Swedes didn’t want to rush into their 11th full-length without their usual democratic prudence. That doesn’t mean they weren’t enterprising, however. Drummer Jivarp and long-time keyboardist/tactician Martin Brändström had up to 20 songs on offer, before the rest of the band shaved it down to 12 key tracks. The songs were then re-shaped and re-tooled. As with Construct, there was more freedom, a precedent set by the band not, say, the record label, to try new things, to expand upon ideas that seemed insignificant at the time, but ultimately blossomed into fully formed songs. “Encircled”, “Force of Hand”, “The Pitiless”, and the contemplatively dark “Merciless Fate” are successful products of Dark Tranquillity’s ‘new’ process. Whereas We Are the Void and Construct were dark, city-like, and, at times, cold, Atoma’s center is one of diversity and energy. For certain, there are odes to the monolithic abyss in tracks like “Faithless by Default” and bonus track “The Absolute”, but overall the album represents a more colorful Dark Tranquillity. Across Atoma’s hour-long span, there’s more in common with tracks like “Hours Passed in Exile” and “The New Build” and “The Wonders at Your Feet” than, say, “Uniformity” or “Dream Oblivion” or “Iridium”. For long-time fans, Atoma is best represented by a single word: urgency. There’s criticality to what Dark Tranquillity are up to. As expected, there’s heft—physical and emotional—behind the music. Indeed, Dark Tranquillity’s music has carried seriously honest qualities throughout the years. Album after album, fans have connected deeply with the Swedes. While much of that is in the heartfelt guitar harmonies by Sundin or the ominous moods Brändström beams, there’s also lyrical weight, with emphasis on presentation by Stanne. The two—music and lyrics—are inseparable, really. With Atoma, Stanne and team decided world events were too vital to ignore. Fortunately, as most mellow with age, Dark Tranquillity are likely traveling in the opposite direction. For all the vibrancy and new hues Dark Tranquillity imbued in Atoma, there is also loss. Actual loss, in fact. Earlier this year—after faithfully serving as bassist, guitarist, and songwriter for two and half decades—founding member Martin Henriksson realized he had enough. Luckily, the parties ended the relationship amicably, with Henriksson moving from band member to back office, where the business side of things is handled. With Henriksson out, the second guitar slot is currently vacant. Separately, Dark Tranquillity transitioned age-old friend Anders Iwers, also bassist for Tiamat and re-activated cult death metal act Ceremonial Oath, from session work to permanently join the fold. 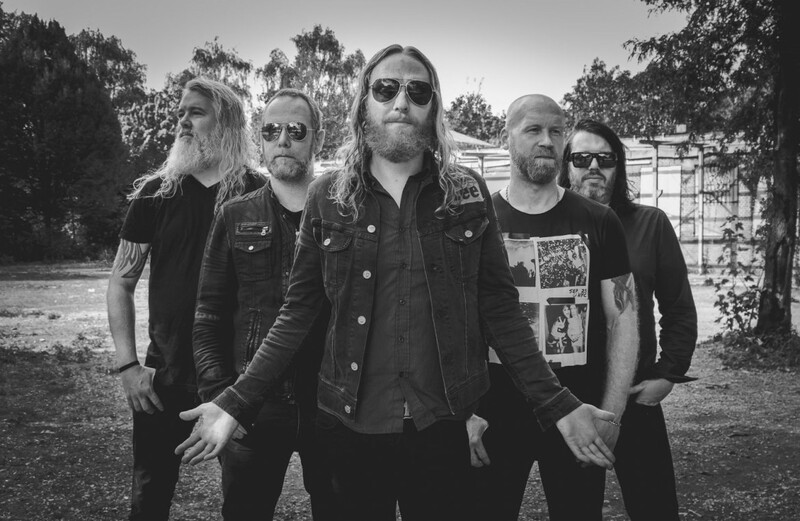 With a new album, a new lineup, and a refreshed outlook, Dark Tranquillity are stronger now than they were six months ago; they’re a better band than they were 10 years ago; and the Swedes are far more resilient now than they were as wide-eyed teenagers. No question, it’s been a saga and a journey. But Atoma is the start of a new chapter. It represents new life. With tracks like “Forward Momentum”, “Force of Hand”, “Our Proof of Life”, and the riveting title cut, there’s no stopping Dark Tranquillity in 2016. Or, in the years to follow.